In a pot, heat the water with a pinch of salt. When the mixture comes to a boil, turn off the heat and add all the flour at once. Stir until well mixed; in one moment the mixture will become too difficult to stir and have a cookie-dough like consistency. Let cool. Separately, mix the cinnamon and sugar together in a dish or large plate and set close to your stove-top. While the dough is cooling, prepare the hot chocolate. Place the milk and chocolate in a saucepan over medium-high heat. Make sure to continually stir and check the chocolate. The mixture will be ready when the entire bar has melted and the milk is very hot. Be careful to not let the milk boil, or it might spill over. After a minute or two, cut the fried dough into churro-sized portions and roll in the cinnamon-sugar mix. Place the finished churros over a serving dish. After you have finished preparing the chocolate, place about 2 inches of oil in a frying pan and pre-heat. Then using a spoon, transfer the dough mixture to a pastry bag. When the oil is very hot, carefully squeeze out a line of dough from the pastry bag into the frying pan. Your dough should look like a ‘swirl’ in the pan. Turn the ‘swirl’ over when the bottom is golden-brown; this should take approximately 5-7 seconds. When done, remove the ‘swirl’ from the oil and place over a paper towel to remove any excess oil. This is it, it’s that easy! 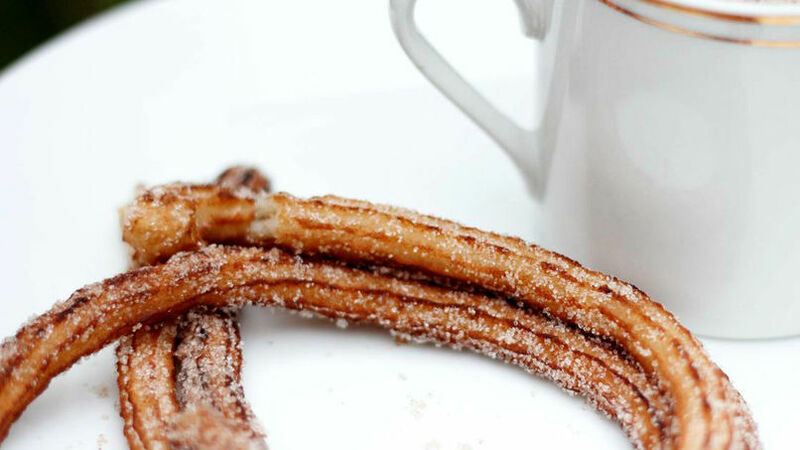 Serve the churros alongside your prepared hot chocolate and enjoy as a delicioso dessert or snack. Have some cooking mitts or potholders ready to protect yourself while cooking. The oil should be very hot at the moment for frying; this way the churros will cook well, finish quickly and be crunchy. You can prepare the chocolate in advance, then heat later when the churros are ready. Between the many riquísimos Latin desserts, one distinguished example is churros. There are many types available: small, large, with sugar or cinnamon, orange-flavored, filled with cajeta or dulce de leche, pastry cream, chocolate and more. But for me, the traditional thin churros dusted with cinnamon and sugar, and dipped in creamy hot chocolate are still the best. They are easy to make and have an exquisito flavor; here I’ll show you how to make them.